Well done to all the member who tackled the 2013 Redcar half marathon. For the second year running, this great event – superbly organised by Redcar & Cleveland council and Redcar Running Club – was marred by poor weather. Despite the clear blue skies and bright sunshine, a strong south-easterly wind meant conditions in the middle section of the race were far from ideal. But in spite of this, there were still some stunning performances with several members recording PB’s. David Beech was first back for the club, finishing in 20th position overall, but disappointed with his time of 1:20. On his day, David is easily capable of a sub 1:15 time but this wasn’t that day. But I’ve no doubt he’ll bounce back stronger in this next race. I was next finisher for the club, happy to cross the line just under my pre-race target of 1:24. After making the sort of error that even a schoolboy wouldn’t do – I was late getting to the start line and had to settle for place at the back of the starting field – the first 800m was eventful to say the least, ducking and diving, bobbing and weaving and generally making a nuisance of myself as I made my way past the throng of runners ahead of me. Thankfully things had calmed slightly as I reached the 1 mile mark and the next few miles were taken at a steady 6’15 pace. The route did a u-turn after 3 ½ miles, and although this meant running into a slight headwind it also gave an opportunity to cheer on team-mates and competitors from local running clubs (Heaton, Wallsend, NSP and Blyth just some of the clubs well represented in the race). But a few minutes later, as I wished the tail-enders well and got back into my running, it soon became clear the wind was increasing in strength and I’d have to work a bit more than I’d like to. Reaching the half-way point in a half-marathon usually provides a mental lift, knowing you’re on the ‘homeward’ stretch to the finish, but not here. With a further three or four mile to run into a savage headwind, my morale began to fall after each laboured step. But just as I was approaching my lowest point, salvation arrived in the form of shouts of encouragement from a couple of familiar voices. Amongst the crowd were Lee Morgan (Wallsend) and Les Smith (Heaton), and just hearing their words of support was enough to get me running strong again. The wind whipping off the North Sea was brutal, and this was reflected in my mile splits. From running comfortably at 6’15s I was down to 6’55s and for a short while actually thought about walking for a bit. But with the turning point just ahead (or so I hoped) and a group of three runners a few yards in front acting as a target I carried on and whispered a pray when we finally reached the turning point. BOOM!! With the wind on my back I was away and it suddenly felt like I was floating along the road. And just when I thought things couldn’t get any better, I heard another familiar cheer of support from the sidelines. Ian McDougall (Wallsend Harriers), whom I’d already spotted at the four mile mark, had now travelled to the 11 mile mark and his great words of encouragement were the final boost I needed to complete the race. This was definitely one of the toughest events I’ve done, with the wind making the middle six or seven miles seem to go on forever, but the fact I managed to attain an average of 6’20 over the duration of the race gives me enormous confidence going into my next race. Whereas my race when to plan, at least in terms of achieving a good time, sadly the same thing couldn’t be said for Davy Wright, who suffered stomach cramps at mile three. But whereas many runners would have called it a day, fair play to Davy for carrying on – even though he had to stop a couple of times – and finishing the race in 1:30. As with David Beech, I know Davy will bounce back from this disappointment a lot stronger and more determined next time out. Finishing soon after Davy were Conrad Scott (1:30:59) and Rob Kirtley (1:33:14), both of whom recorded PB’s. To run a PB in those conditions is great testament to the lads and bodes well for future half-marathon races. Nick Pearson was next finisher for the club, his time of 1:35 possibly the price of running cross-country the previous day. Bryan Ankers finished in a time of 1:46 with the first of the TBH ladies, Joanne Wood, finishing soon afterwards. Joanne ran a terrific race, posting a half-marathon PB of 1:47:48, and finished a couple of minutes ahead of 2nd lady for the club, Natalie Ohlson, who looked like she was out for a leisurely stroll whenever I passed her during the run. 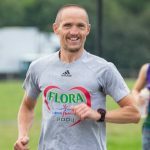 Geof Ellingham was another who appeared to be cruising around the course and his new PB of 1:56 will surely be smashed in his next half-marathon race. Completing the turn-out of Tyne Bridge Harriers was Alison Bathie (nee Habebi) who finished the race in 2:14. As already stated, this is a wonderful event, with a course ripe for PB’s and a glorious goody bag (consisting of Tee-Shirt, Medal, Socks, Arm Reflector and Mars Bar) for the finishers. Many thanks to all the guys I’ve already mentioned for the support during the race and I’d definitely recommend this one for next year. Members results below and full results can be found here. Club members were spread far and wide competing in various events on a busy weekend of racing; well done to everyone who wore the club vest and congratulations to those who achieved a PB in their particular event. In the 2013 Berlin Marathon, Cees van der Land produced a stunning performance by posting a new PB time of 02:49:54. Also competing was Neil Capstick, finishing the race in 03:58:24. The 2013 Nottingham Half-Marathon saw two TBH runners clock PB’s. Emma Wright continued her recent good form by PB’ing with a time of 01:39:45 whilst Ryan Hogben also ran a great race, coming home in 1:40:43. The Nottingham Festival of Running also featured a marathon event, with David Anderson completing the race in 3:08:17. In the BUPA Great Yorkshire Run, Anji Rippon ran her quickest 10K time in two years by clocking 50:12. Alan Hodgson ran a terrific race in the Loch Ness 10K, finishing in a superb time of 36:40, while Tyne Bridge had two representatives in the Cheshire 10k, with Steve Cairns finishing 4th overall (1st M45) in 32:50 and Izzy Knox completing the race in 40:30. Alan Hodgson sends this mini-report from highlands of Scotland. Well living in Tanfield Lea, I can’t believe that the weekend of the Sherman Cup I’m in Inverness! My favourite part of the world and after a dreadful year I was hoping to finish with a confidence booster. It was absolutely baking hot as I set off through the most scenic of venues, I managed to dig in and stick to my plan of aiming for 6 minute miles and finished in 36:40. Not a PB but thanks to Double D’s sessions a much needed boost for future races. I never managed to solve the legend.. No, not the one about Kenny Mac not buying a round but the big green thing lurking in the waters but another lovely trip to Scotland nevertheless. Definitely a race for TBH’ers to consider. Alan.